"Quick and easy, using frozen pre-chopped veggies, frozen shrimp, and an easy sauce. Serve over rice or with noodles and enjoy"
Mix chicken stock, soy sauce, cornstarch, and garlic in a bowl; season with salt and pepper. Heat sesame oil in a large skill over medium-high heat until oil shimmers; cook and stir vegetables in hot oil until softened, about 4 minutes. Add shrimp; cook and stir until shrimp begin to turn pink, about 3 minutes. Stir chicken stock mixture into vegetable-shrimp mixture. Continue to cook and stir until vegetables and shrimp are coated and sauce is thickened, about 5 minutes more. A simple chicken-and-veggie stir-fry with sweet and spicy flavors. Easy and delicious. Lots of opportunity for personalization in the future. Most ingredients are already in the kitchen, a BIG plus. it was quick, it was easy and it was delicious. This is the kind of recipe i need after a long day of work! Thank you! Excellent absolutely wonderful thanks for sharing! 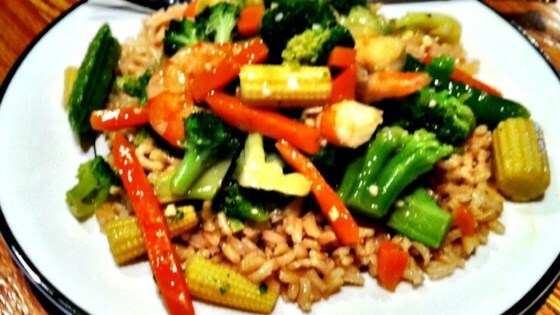 This worked great for me since I always have frozen stir fry veggies on hand. I added about an inch of grated ginger root, and don't add the shrimp till 3-4 minutes before the sauce is done!